UK based Ugandan singers DENIS MUGAGGA and DAN SEWAGUDDE (formerly of DaTwins fame) have teamed up with UK world musician, arranger, record producer and film composer, CRAIG PRUESS, to form a new and exciting band, the GANDA BOYS. Three years in the making, and many concerts later, the Ganda Boys have considerably expanded their sound and vision for a global audience and international humanitarian causes. Building on their previous albums, Africa” and “War of Love”, the well-crafted songs engage emotive and global themes, including some powerful tribal chants from Uganda brought up to date with well-crafted arrangements; contemporary, punchy and authentic percussion; and state-of-the-art mixing and productions. Even string arrangements with a bona-fide string orchestra (Lithuanian State Chamber Orchestra) for extra emotion and sweeping scope are impressively incorporated. The album has both vocal maturity and moments of intense soul, all the time showing instrumental excellence with ambitious and high end arrangements. The block tribal vocal harmonies of the Ganda Boys’ sound are evocative and pleasing. There are no covers on this album, and the song-writing is of an international standard. Featured guest vocalists include: the propulsive and warm Zulu chants of Babuyile Shabalala (from the Ladysmith Black Mambazo family) with his young, cutting-edge South African vocal group, Young Mbazo; hugely popular and honoured East African vocal force, Juliana Kanyomozi, who is a multiple KORA Award winner (equivalent of the African GRAMMY Award); American singer, Carole Rowley, who has sung with Sting, Peter Gabriel and Van Morrisoon; and lastly, Ugandan smooth jazz artist, Isaiah Katumwa, is featured on soprano saxophone on the title track, “Mountains of the Moon”. UK rock record producer and sound engineer, Keith Bessey, has contributed a very muscular sound to two of the tracks on the album which pack a particular first-class punch: “Big Machines” and “United We Stand”, which he co-wrote and mixed and mastered. Throughout, the recorded sound and mixing brings the songs to their ultimate level, and the whole album of 17 tracks is a listening adventure — something back to the bygone era of proper albums! The album was inspired by an awesome mountain range that straddles the borders of Uganda to the west and Congo to the east: the Rwenzori Mountains. The tribal legends tell of a great civilisation that once existed there, later to influence the whole world….. It was pre Egyptian, pre-Nubian, and there is good evidence that this was the original Garden of Eden. Indeed, the oldest hominid remains on Earth (20 million years old) have been found in Karamoja in eastern Uganda. The tribal chiefs tell of a just and highly developed society that honoured women, wisdom, nature and all aspects of culture, poetry, art and music…… an inspiration that we can strive to return to in our mechanistic and conflict-ridden world. The Ganda Boys have just finished their first album, “The War of Love” – 12 captivating tracks, a journey through the hearts and souls of three expressive personalities. 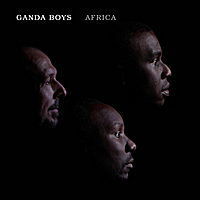 Although the origins of much of the Ganda Boys music are Ugandan, the album has a “United Africa” feeling to it, with a high level of live band production and rich recorded sound. There is a contagious energy that builds through the moods of the tracks. Features everything from a childrens choir from Uganda to a string orchestra in Lithuania! Fine performances, too, by some of the UK’s top session guys. This is part and start of an extra special musical journey! ..And you were there at the beginning with us! Accessible African fusion inspired by the native chants. melodies and instruments of Uganda, with an effortless/seamless fusion of English verses and Luganda black harmony choruses for an uplifting effect. It is an exciting marked departure from the Ganda Boys’ other three music albums in that it focuses on a Ugandan folk orchestra sound coupled with their trademark vocals. Also, the beautifully woven drum rhythms of the album are taken from the drum patterns from across all the Ugandan tribes, yet the international level of the music arrangements/produced sound will be appreciated across the globe, giving a strong cultural impact, similar to how Ladysmith Black Mambazo put South African township close harmony singing on the international map, or Osibisa with Ghanaian music.